ASEC – RIPESS Asia was present at the International Conference on SDGs localisation held from 22 to 24 February 2019 in South Korea. At this event, Professor Denison Jayasooria presented some reflections from a malaysian case study among flat dwellers that highlights the important role of SSE in the localization of SDGs. Written by Prof. Denison Jayasooria, Chair of ASEC/Ripess Asia and member of the RIPESS Global Board. 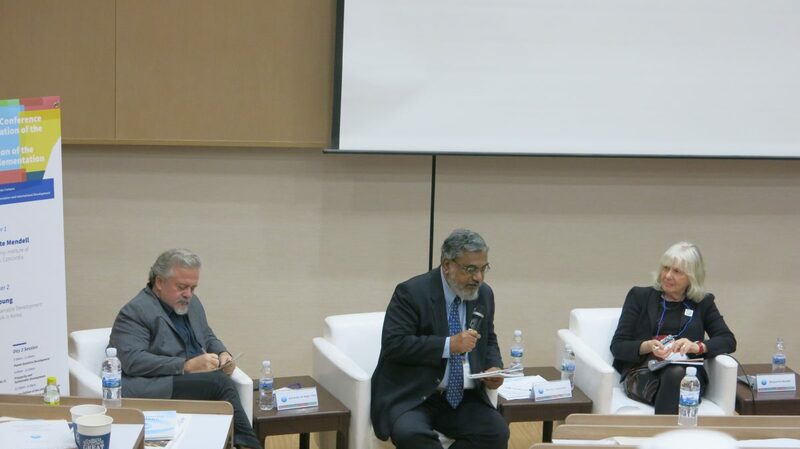 The International Conference on the localising of SDGs at Wonju Campus of Yonsei University in South Korea on Feb 23, 2019 was an excellent ocasion to present a case study paper on a Malaysian experience. This was based on field data collected from 12 urban neighbourhoods with over 43,000 people living in the Klang valley in Malaysia. They are high rise flat dwellers from Bottom 40 percent, socio-economic divide. Malaysia has experienced rapid urbanisation and modernisation, where sizable rural communities migrated into the cities. High rise flats became their eventual dwelling place but these neighbourhoods are manifested with n numerous urban problems such as crime & gangs, drug & alcohol abuse and major issues pertaining to building & public space maintenance including waste clearance. From the field data which was gathered through focus group discussions and interviews, with local neighbourhood leaders, we can recognise that the local people are able to identify local issues and needs. They are also able to prioritise their concerns and address them through local solutions. However they struggle to secure the support of local agencies to assist them in resolving their challenges. The case study identified an initiative of the federal government thorough the Department of National Unity & Integration who have introduced a program called ‘Love your neighbourhood’ whereby local leaders solve their issues in partnership through interagency cooperation. The case study shows the close working with Police, Anti-drug agency and local government in solving local concerns. In this context it is noted that both representative and participatory democracy is necessary to find lasting solutions. This is a very important theme of the SDGs where local issues are identified in a multi-dimensional way requiring the involvement of multi agencies and stakeholders in finding a solution. There is good potential for partnership as highlighted in SDG 17.17 in addressing inequalities (SDG10) among the urban poor as well as addressing urban concerns through better city govern (SDG11).